Breakfast on the 2nd day of the tour is followed by departure to the Havelock Island through ferry. From here, this island is located at a distance of 54 km from the sea route. After arriving in Havelock, get transferred to a plush hotels.After lunch, leave the hotel to go to the world-renowned Radha Nagar Beach (Beach number 7), which is one of the best beaches in India.The serene ambience and pristine surrounding has ensured that Havelock Island has emerged as a favored honeymoon destination in India, especially during winters.Stay overnight stay at your hotel in the Havelock Island. On day 3, have your breakfast and get ready for an action-packed day filled with an amazing snorkelling experience. 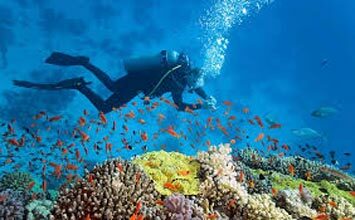 Snorkelling in Andaman Island is one of the most sought-after water activities, to explore the colourful under-water world.For your snorkelling trip, get on-board a boat (40 minute) that takes you an apt location in the sea for beginners. The Elephant beach has been blessed with tranquil blue shallow waters. While on the boat, slip-in your snorkelling gear.The reef, consisting of hard coral and exotic marine life in abundance, is quite close to the shore, around 1 meter. The trip comes to an end at around 12:30 p.m. if you want, you can spend some relaxing moments at the beach. The white sand and the uprooted trees are a real treat for the eyes. After exploring the coral island, back to the hotel for an overnight stay. Today after breakfast, you visit the Kalapathar Beach. The road that leads to this beach is a beautiful one. (Please check-out from your hotel and keep your luggage packed at the reception). Back to the Havelock Island in the afternoon or in the evening as per the available tickets to Port Blair.After arriving in Port Blair, get an assisted transfer to your pre-booked hotel, the rest of the evening is free for you to indulge in fun activities. Overnight in Port Blair. Post breakfast, your trip to discover the under- water marine life in a boat begins. Embark on an exotic glass bottom boat for exploring the rarest of variety of corals. This is followed by snorkelling in the North Bay. 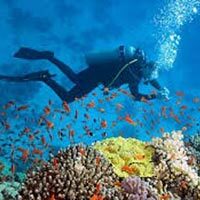 Once you are done with exploring the marine- life in the crystal clear sea waters of Port Blair, visit Ross Island. This island was the capital of Port Blair during the British rule. Here, you can partake in sightseeing including Government House, Chief Commissioner# s House, the Cemetery, The Church, Bakery, Swimming pool and more. Thereafter, you embark on a Harbour Cruise to visit the tiny beautiful Viper Island. Once you are on the Island, you can visit the ochre-coloured brick jail, established by the British, way back in 1867. Return to the hotel for an overnight stay.